In small bowl, mix topping ingredients with fork until crumbly; set aside until serving time. In large bowl, stir together 1 cup Bisquick mix, the egg, milk and vanilla with whisk just until blended. Remove 1/4 cup batter to another small bowl; stir in 1 tablespoon cinnamon until batter is dark. Add cinnamon batter, 1 tablespoon at a time, to remaining vanilla batter, swirling lightly with spoon. Heat griddle or skillet over medium-high heat (375 degrees). Brush with vegetable oil if necessary (or spray with cooking spray before heating). For each pancake, pour about 1/4 cup batter (or desired amount) onto hot griddle. Cook about 3 minutes or until bubbles form on top. Turn; cook other side until golden brown. Meanwhile, in small microwavable bowl, microwave pie filling uncovered on High 1 to 2 minutes or until warmed. 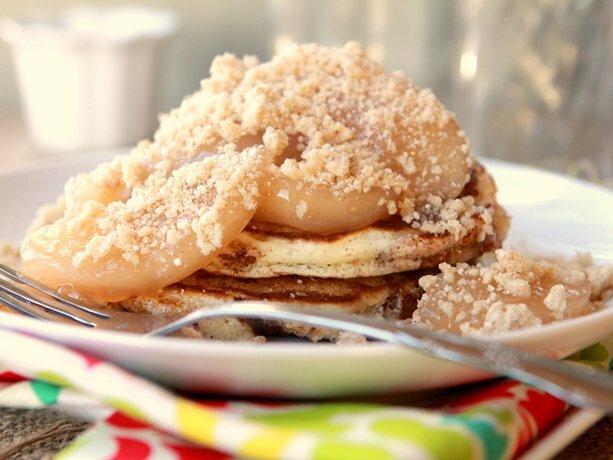 Top pancakes with a pat of butter and spoonful of warm pie filling; sprinkle with streusel topping.